CEDEX Plastics will officially launch its polyethylene film manufacturing operations, amidst an opening ceremony with joint venture partners, on 8 July 2010 in Zouk Mosbeh, Lebanon. 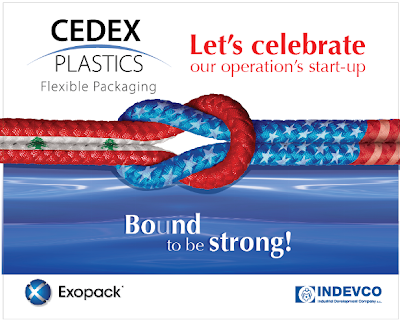 CEDEX is a joint venture signed in April 2009 between Exopack, a flexible packaging and coated film manufacturing group headquartered in Spartanburg, South Carolina, and INDEVCO, a multinational packaging and consumer disposables manufacturing group headquartered in Ajaltoun, Lebanon. Located in close proximity to PE resin suppliers, CEDEX will produce and export co-extruded PE films for the North American market. The joint venture company invested in a 3-layer VAREX® co-extrusion film machine line from Windmoeller & Hoelscher, which was installed adjacent to MASTERPAK flexible packaging plant, a sister company in INDEVCO Group. CEDEX’s product portfolio will initially feature AquaCrystal® Select high-clarity shrink film and CaseFLEX™ Select corrugated case overwrap film, as well as heavy-duty shrink bundling film. In parallel, CEDEX capabilities are under expansion for lamination film (sealant film), surface printable film, and towel and tissue overwrap. With over a half century of combined experience in the Middle East and North America, INDEVCO and Exopack share common competencies in film and flexible packaging manufacturing to support customers from a global sourcing and innovation perspective. By taking advantage of lower resin pricing in the Middle East, CEDEX has the capability to produce export-oriented films for the North American market.The joint venture is the initial phase of a longer-term strategy to continue to build multiple plastic film production sites in the Middle East. Currently managing 17 production facilities strategically positioned across North America and the United Kingdom, as well as a global network of alliance partners, Exopack is an established leader in the development, manufacture, and sourcing of paper and plastic flexible solutions for various consumer and industrial end-use markets. Exopack Holding Corp. is an affiliate company of Sun Capital Partners, Inc. For more information, please visit www.exopack.com or call 877-447-3539. Founded in 1955 by Georges N. Frem, INDEVCO Group is a privately-owned multinational group comprised of over 55 manufacturing plants, industrial & commercial enterprises. The oldest and largest flexible packaging company in the Middle East, INDEVCO has a global production and distribution platform for its products and services, including nine manufacturing sites in North America. We provide exclusive access to top grade independent film projects and producers.